You know me... always running late. Honestly, this page is weird. I had to redraw that top panel bc it was looking a bit too eye of sauron before. ANWAYS! Here's some exciting news about "preorderssss". I actually do have a lot of stock of (most) of these prints so they will probably ship out a lot sooner than the late February ship out date. It’s FREE SHIPPING to United States customers, and this is ONLY for United States. I do want to ship internationally in the near future but for now it’s just something that seems a bit intimidating. 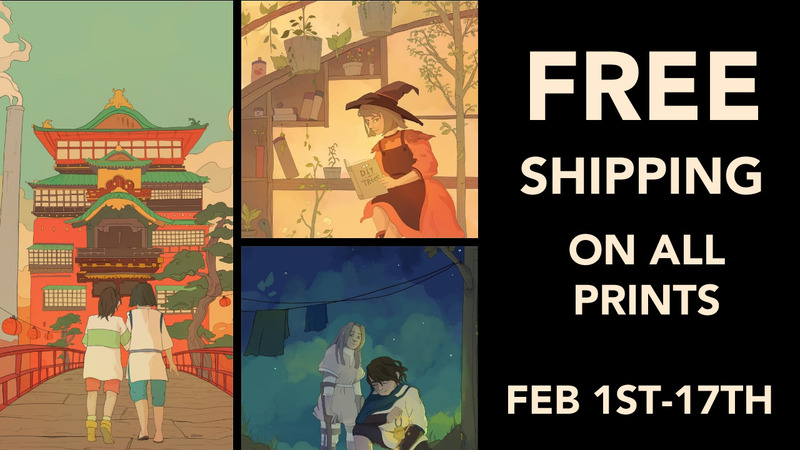 After the preorders close (FEB 17th), my shop will move over to Etsy, and shipping will no longer be free. I know that the preorder shop set up is a little ratchet (you only get 4 free listings, okay??) but I’m trying to save on those fees :’). You can find bigger image versions over on my Instagram. Nearly all of these prints are fan art, which I have mixed feeling about. I DO want to have a LOT more original art in the future, but it seemed really daunting to try be an unknown artist selling original works in the AA while also trying to make back expenses and reinvest in future products. (The prints online right now are basically what I sell at conventions). Soo, a lot of fan art for now, but it IS something I am actively trying to change! The next “preorder” will likely be mid summer.